Every year the College hosts Observer Briefing Calls as part of our ongoing College education and development programs. During these hour-long presentations, the College representatives to other organizations provide information on numerous topics, including (but not limited to) updates on laws and regulations, as well as non-ACCFL task force or committee/commission activities. ACCFL holds its Annual Meeting & Dinner in the Spring, and a Fall Dinner & Advanced Seminar in the Fall each year. Although a separate event, the College gathers for its Annual Meeting & Dinner on the Saturday following the ABA Business Law Section Spring meeting. At the College's Annual Meeting, fellows vote for Officers for the upcoming year, as well as for new Regents who will serve for three years on the College's Board, replacing a graduating class of Regents. Officers and Committee Chairs update the fellowship on the past year's activities and project outcomes, and report on progress toward College goals. Plans for the upcoming year are reviewed. New Fellows, whose nomination for Fellowship have been approved by the Board of Regents, are presented to the College. Prestigious awards are presented during the meeting. The 2019 Annual Meeting & Dinner was held on Saturday, March 30, 2019 at the historical Vancouver Club in Vancouver, B.C. Canada. Fellows E. Carolan Berkeley and Sandra M. Rocks were presented the Homer Kripke Achievement Award for their leadership and history of exceptional dedication to the improvement of commercial finance law and practice. The newest class of Regents was voted into office, and the 2019-2020 Executive Committee was introduced. Marc L. Klyman, Vedder Price P.C. The College acknowledged these 2019 sponsors: Blake, Cassels & Graydon LLP, Borden Ladner Gervais LLP, Cassels Brock & Blackwell LLP, Cleary Gottlieb, Steen & Hamilton LLP, Corporation Service Company (CSC), Patrick (Buzz) Guida (Duffy & Sweeney, Ltd.), Fennemore Craig PC, Lane Powell PC, McGlinchey Stafford PLLC, Nader, Hayaux & Goebel, Sidley Austin LLP, and White & Case LLP. The 2018 Annual Meeting & Dinner was held on Saturday, April 14. 2018, at Charley's Steak House, in Orlando Florida. The College elected its new Board of Regents and Executive Committee, and welcomed and inducted eleven (11) new Fellows during the meeting. Fellow Frederick Miller was honored with the prestigious Homer Kripke Achievement Award. Feedback was extremely positive about food, ambiance, and collegiality of the event. Fellows were pleased to welcome the highly qualified new Fellows, and to support the continuation of the College's mission and ideals with the choice of the 2018-2019 Board of Regents and Executive Committee. Sponsorships were provided by: Cleary Gottlieb Steen & Hamilton LLP, McGlinchy Stafford, PLLC, White & Case, LLP, and the The ACCFL Fellows at Sidley Austin LLP. For information about Past Annual Meetings & Dinners, including photos, please see "Past College Events". The College hosts a yearly Fall Dinner and Advanced Seminar, which follows the ABA Business Law Annual Meeting. The Dinner has grown in popularity, perhaps because it allows Fellows the opportunity to share a special time with College colleagues. The Advanced Seminar is led by Fellows who have a breadth of knowledge and experience in a topic chosen by the College that is timely and relevant to the current state of corporate finance law. The Advanced Seminar is interactive and lively, despite its early Sunday morning time. Fellows and guests gathered for the 2018 Fall Dinner & Advanced Seminar in Austin, TX. The Dinner was held on Saturday evening, September 15, 2017 at Lambert's Downtown Barbecue. The evening's food, ambiance and collegiality transformed a pleasant event into a dynamic and delightful evening for all! The College's Advanced Seminar, held on Sunday, September 16th at Winstead, PC was as enjoyable as it was educational. Fellow Prof. Stephen Sepinuck's seminar lived up to expectations, challenging attendees throughout the morning - causing fellows to be even more grateful for Winstead's sponsorship. The seminar was held Winstead's Austin office, with a delicious, nourishing breakfast served that kept attendees going all morning long! In addition to Winstead's gracious sponsorship of its offices and provision of breakfast, the College appreciates the sponsors for the 2018 Fall Dinner & Advanced Seminar: CSC, Patrick (Buzz) A. Guida (of Duffy & Sweeny), McGlinchey Stafford, and White & Case. For information about past Fall Dinner & Advanced Seminars, see "Past College Events"
College Fellows are representatives to other organizations. Fellows are Involved in other organization group projects designed to advance the practice of commercial law. 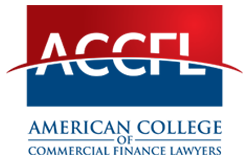 ACCFL Fellows are considered both participants and observers that represent the College. Fellow participants provide updates through Observer Briefing Calls. See Representatives to Other Organizations for further information about the various projects in which ACCFL colleagues are involved. Please go to Observer Briefing Calls for more detailed information about this College program.